Save lives on the job through compliance with NFPA 70E®. Newly updated, the 6-part NFPA 70E Online Training Series teaches you how the Standard's life-saving work practices help avoid electrical injuries, deaths, and OSHA violations. Get the up-to-date NFPA 70E training you need -- in your own timeframe -- with the NFPA 70E Online Course Series. Hundreds of worker deaths and thousands of injuries could be prevented each year by following the latest edition of NFPA 70E, Standard for Electrical Safety in the Workplace®. Originally developed at OSHA's request, NFPA 70E provisions are applied to identify electrical safety hazards and reduce employee exposure to those hazards. Revised to reflect the 2018 edition of NFPA 70E, NFPA®'s professionally narrated series uses video, concept reviews, and examples to provide vital information about today's Standard. Six individual courses introduce the safety-related work practices and procedures that employees, supervisors, and owners need to provide a practical safe working area for employees relative to the hazards arising from the use of electricity. Complete this seven-hour course series and qualify for 0.7 CEUs. Completion of each individual one-hour course qualifies you for 0.1 CEU. Upon successful completion of a course or the course series, participants will be prompted to download the CEU certificate directly from the course site. Learn how NFPA 70E is used to minimize employee risks from electrical hazards and help comply with OSHA. Go online to take Introduction to Electrical Safety and NFPA 70E in your own timeframe -- and be ready to protect workers on the job. 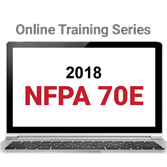 NFPA 70E is revised for 2018, and so is this essential online training series from NFPA®. Make sure you know how the latest edition of NFPA 70E protects personnel from deadly electrical hazards. This self-paced course is the first of six courses covering various aspects of the safety-related work practices and procedures addressed by the latest edition of NFPA 70E: Standard for Electrical Safety in the Workplace®. The course begins with an overview of the lessons and instructions on how to navigate NFPA 70E Online Training. Then, you'll learn how the standard is intended to aid workers and employers in minimizing the risk of employee injuries from electrical hazards and to establish a safer workplace for employees who work on or with electrical equipment. Introduction to Electrical Safety and NFPA 70E consists of three lessons that cover the purpose and scope of the standard, the nature of electrical hazards, and the general requirements for and elements of an effective electrical safety program. Electrical safety in the workplace depends NFPA 70E and you! Learn how to use the 2018 edition of the standard to conduct an accurate electrical hazard analysis and determine safe approach boundaries. Updated for the 2018 edition of NFPA 70E: Standard for Electrical Safety in the Workplace®, this self-paced online course addresses the latest requirements and methods for analyzing the hazards and risks of work that involves exposure to electrical hazards. Electrical Hazard Analysis consists of two lessons that cover the assessment of arc flash hazards and electrical shock hazards. This analysis becomes the basis for selection of appropriate safe work practices including Personal Protective Equipment (PPE) as covered in other courses. An introduction to electrical safety and NFPA 70E, establishing an electrically safe work condition, working while exposed to electrical hazards, Personal Protective Equipment (PPE), and safety-related maintenance and special equipment are covered in other modules in the series. Go online to learn how to reduce electrical risks at work! Take this online course to understand the vital importance of establishing an electrically safe work condition using the 2018 edition of NFPA 70E. Improve awareness about the potential for shocks, burns, and devastating electrical incidents on the job. NFPA 70E: Standard for Electrical Safety in the Workplace® helps you avoid electrical injuries, deaths, and OSHA violations. Updated to reflect the 2018 edition of this important standard, NFPA®'s self-paced online course covers the elements of an "electrically safe work condition" commonly called lockout/tagout procedures, the principles of lockout/tagout, energy control procedures, and temporary protective grounding. Establishing an Electrically Safe Work Condition -- Course 3 in the NFPA 70E Online Training Series -- consists of two lessons that cover the essential steps in lockout/tagout procedures that are used to establish an electrically safe work condition as well as the details of those procedures. An introduction to electrical safety and NFPA 70E, working while exposed to electrical hazards, electrical hazard analysis, Personal Protective Equipment (PPE), and safety-related maintenance and special equipment are covered in other modules in the series. Anyone concerned with electrical safety including: electrical engineers, safety managers, electricians, electrical contractors, plant managers, facility maintenance personnel, electrical inspectors, risk managers,mechanical engineers, HVAC installers, designers, and project managers. Make sure you understand the facts. Working "live" or "energized" exposes personnel to even greater electrical risks, and compliance with the 2018 edition of NFPA 70E® provides life-saving protection. Don't miss this self-paced online course addressing the sections of NFPA 70E: Standard for Electrical Safety in the Workplace® that provide workers with safety guidelines for situations where de-energizing is not possible or where de-energizing could create increased or additional hazards. Working While Exposed to Electrical Hazards -- Course 4 in the updated and revised 2018 NFPA 70E Online Training Series -- presents three lessons that cover the requirements for analysis of the electrical hazards and risks of working on energized electrical parts, the requirements for energized electrical work permits, and other precautions for activities involving electrical hazards. An introduction to electrical safety and the 2018 edition of NFPA 70E, establishing an electrically safe work condition, electrical hazard analysis, Personal Protective Equipment (PPE), and safety-related maintenance and special equipment are covered in other modules in the Series. Anyone concerned with electrical safety including: electrical engineers, safety managers, electricians, electrical contractors, plant managers, facility maintenance personnel, electrical inspectors, risk managers, mechanical engineers, HVAC installers, designers,and project managers. Complete this two-hour course and qualify for 0.2 CEU. Upon successful completion of a course, participants will be prompted to download the CEU certificate directly from the course site. Learn how to choose and use the right PPE! Understand the importance of adequate Personal Protective Equipment and how the 2018 edition of NFPA 70E helps you choose the right PPE for the job. Do you know? Arc flash is immediate and can happen without touching live components. Essential for everyone responsible for electrical safety on the job, this self-paced online course covers the general requirements in the 2018 edition of NFPA 70E: Standard for Electrical Safety in the Workplace® for Personal Protective Equipment (PPE) -- including how to select PPE for the specific hazards involved with various tasks. Personal Protection Equipment -- Course 5 in the updated 2018 NFPA 70E Online Training Series -- consists of three lessons on the requirements for selection and use of arc-rated clothing as well as the selection and use of other PPE for protection from arc flash and shock hazards. An introduction to electrical safety and the 2018 edition of NFPA 70E, establishing an electrically safe work condition, working while exposed to electrical hazards, electrical hazard analysis, and safety-related maintenance and special equipment are covered in other modules in the Series. Electrical safety on the job depends on timely and correct equipment maintenance. Learn about Safety-Related Maintenance and Special Equipment as addressed by the 2018 edition of NFPA 70E. Newly revised and updated, this self-paced online course covers the requirements in Chapter 2 and Chapter 3 of the latest edition of NFPA 70E: Standard for Electrical Safety in the Workplace®. Safety-Related Maintenance and Special Equipment -- Course 6 in the updated NFPA 70E Online Training Series -- consists of two lessons that cover required maintenance of electrical equipment as it relates to electrical safety in the workplace and requirements for safety of employees who work with specific special types of equipment. This includes some hazards not specifically addressed in Chapter 1 of NFPA 70E. An introduction to electrical safety and the 2018 edition of NFPA 70E, establishing an electrically safe work condition, working while exposed to electrical hazards, electrical hazard analysis, and Personal Protective Equipment (PPE) are covered in other modules in the series.